Greg has been my good friend since the fifth grade. While he was visiting us in Rochester this weekend, we took to the sky Saturday morning for a little sightseeing. Though conditions were poor for a long flight (we gave up on any plans of flying to breakfast), the autumn weather made for many beautiful sights. 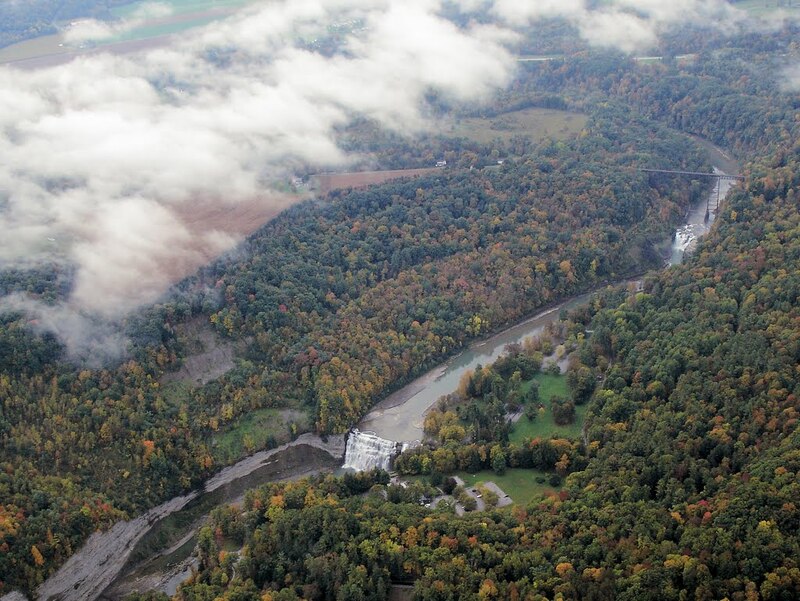 Low clouds nearly obscured the waterfalls in Letchworth State Park, but not quite. 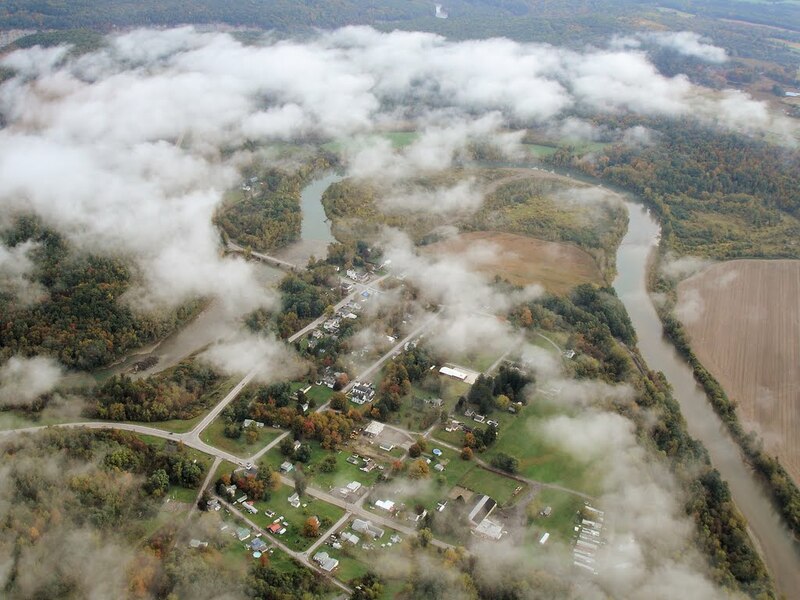 The low clouds did obscure Portageville, NY, partially surrounded by an oxbow in the Genesee River. From Letchworth State Park, we proceeded to Dansville, NY where we had a second breakfast at the truck stop diner before meeting Kristy and The Bear for a hiking expedition at Stony Brook. After hiking, we departed Dansville to the southeast and flew past the windmills set high on a plateau overlooking I-390. Greg had never visited the Finger Lakes before, so we flew north along Canandaigua Lake under a dark, localized overcast. 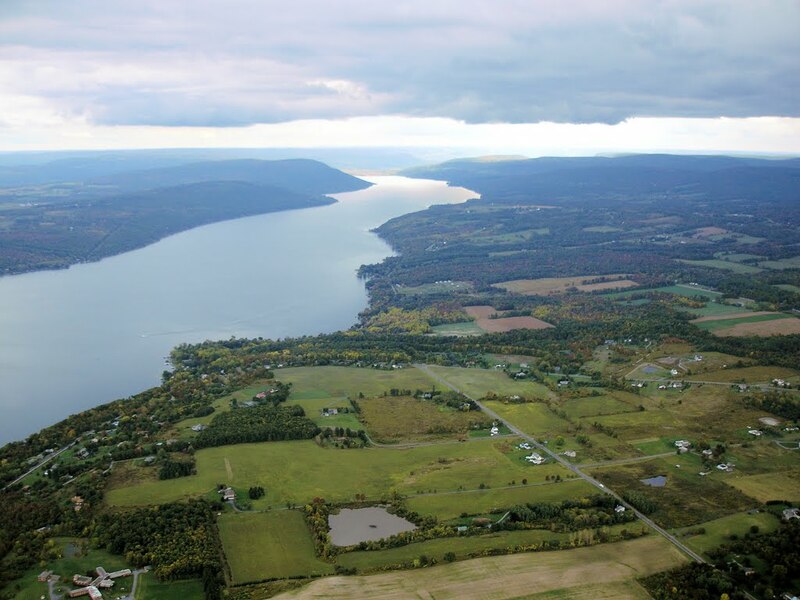 Canadiagua is not one of the largest Finger Lakes, but it is a respectable specimen. Once clear of the lake, the clouds, and the highest terrain, I turned the controls over to Greg and gave him his first experience flying an airplane. After he came all the way from Michigan for a visit, it was the least I could do. Rolling into a left bank after departure from Rochester's runway 25, I watched a shimmering reflection of city lights slide across my port wing. The radio was silent; mine was the sole aircraft occupying the inner sanctum of Rochester's Charlie airspace, pirouetting at each corner of the rectangular traffic pattern. Above the horizon, stars comprising the Big Dipper provided a sense of depth to the infinite darkness. When I flew at night in years past, I maintained minimal cockpit lighting such that the airplane itself disappeared and I would be soaring alone beneath the moon and stars. After completion of avionics upgrades earlier this year (not to mention a repair to the radio lighting circuit), the interior of my airplane glows softly at night with the reflected light of instrumentation. Bathed in the artificial light, I became keenly aware of the airplane wrapped around me, that I was ensconced in what Ernie Gann called an "island in the sky". My quiet flight was interrupted by a shill electronic alarm sounding 3,000 times per second. I was startled by the unfamiliar noise, but quickly realized that I was turning over the threshold of runway 4 and that the noise was the inner marker associated with the runway 4 ILS approach. Silence returned to the cockpit once I passed beyond the range of the narrowly focused radio beacon. "Cherokee 481, clear touch and go, runway 25." The tower controller sounded almost bored. I began descending for another landing and the city seemed to swell in size as I passed below the tops of the high rises at city center. Where the invisible black serpent of the Genesee twisted through downtown, it was outlined in lights like a watery runway. The illuminated rotunda of the University of Rochester library shone brilliantly, a symbolic beacon of knowledge in the night, before passing beneath my starboard wing. As the airplane and I swam through placid nighttime air, I surveyed the bejeweled landscape below and reaffirmed how much I enjoy flying at night. It was also a first of sorts; my first night landing at a Class Charlie airport. A minor "first" really, but a first nonetheless. Inbound, I noticed that locating an urban airport at night is different than finding the small, rural airports I usually visit. Rural airports are easy to find in the darkness because their rotating beacons and runway lighting stand out from surrounding farm country. For an airport enveloped by civilization, however, airport lighting competes poorly with the luminosity of the surrounding city. Indeed, the Rochester airport first became visible to me, not as an array of colored runway lights, but as a black hole among man-made stars dotting the landscape. I remember telling friends in 2001 that I was going to learn to fly. Most were very supportive. A coworker used to ask me and Kent at least once a week, "how are the flyers doing?" The naysayers, on the other hand, were few but memorable. One person told my wife that they "could not believe [she] was permitting me do that." An acquaintance who overheard me discussing the matter with a common friend interrupted with, "what are you doing that for?" in such a derisive tone that it was clear that my dream to fly was the dumbest undertaking ever. Why did I do it? What was my plan? Honestly, there was no plan. I did it because I could, because I was in love with the dream of flight, and because I relished the challenge. September 23, 2002, with Bill and Two Seven Uniform. Photo by John C.
So there I was, ten years ago, having just conquered sky and check ride. I was master of Cessna Two Seven Uniform and the awesome power of 100 horses harnessed within her petite cowling. My plan after earning my certificate was simple: fly. Beyond that, I had no clue. Frankly, I think the brand new private pilot pictured above would be rather surprised by what has happened since. As a student, I never imagined owning an airplane. That dream - at least in any realistic sense - came later. I never imagined that I would land an airplane at the highest elevation airport in the United States and stand before the iconic mural that I first saw in my ground school textbook. 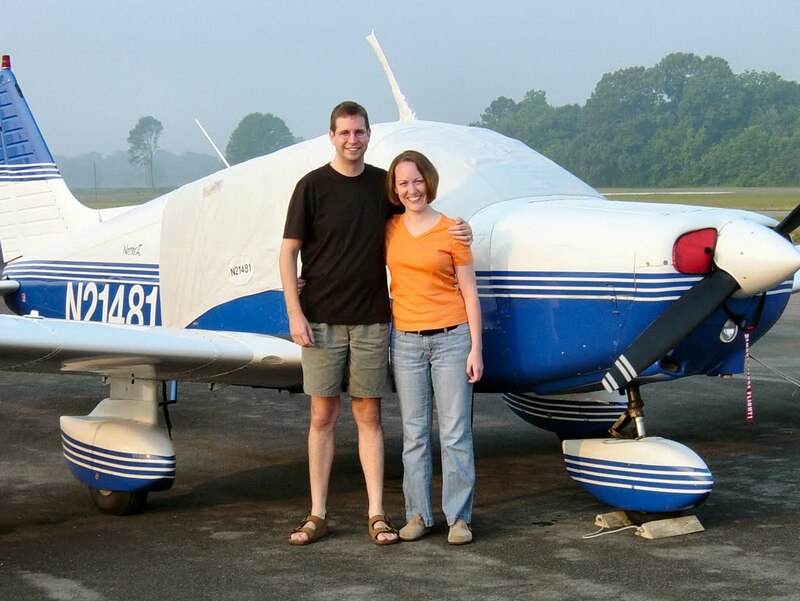 I never imagined that Kristy and I would embark on several multiple state cross country trips by single engine airplane, but we have had many adventures over the years. I never imagined that flying would be something that I and my then unborn daughter would do together. There was no plan, only a journey. 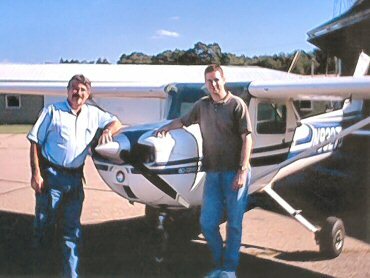 Over ten years, that journey spanned 1092 flight hours, 21 states, 138 airports, dozens of first time flyers introduced to general aviation, mountain training, an introduction to glider flying, instrument training, and many great adventures with friends and family. Aviation has given me many things that I did not necessarily foresee ten years ago: self confidence, therapy, terrific friendships, a visual and poetic muse, passion, a new lens through which to view the world, and virtually unbounded opportunities for self-improvement. The decision I made over a decade ago to pursue flying lessons stands as one of the most satisfying decisions I ever made. As for the coming years, who knows? I'll go wherever the journey takes me. The first decade has been a blast, why mess with what works? DME arcs are airways defined by constant radius turns around a ground-based transponder. Though I do not have a DME (distance measuring equipment) unit in Warrior 481, the GPS is a legal substitute. In fact, glorified DME has been the primary role of my approach-certified Garmin 430W GPS thus far in my training because we have focused on the radio-based backbone of the IFR system (VORs). Although the GPS does not measure slant range distance like a DME, geometry tells us that the differences will be negligible if the arc is of sufficient radius versus altitude. Tom and I tracked toward the Geneseo VOR at 3000 feet. I was to fly an eight mile radius arc between two radials. Although the unblinking eye of the iFly 700 showed that my "arc" looked more like an elephant ear (kind of oblong), the GPS clearly indicated that my arc was flown well within tolerance (+/- 0.5 mile). At the prescribed terminating radial, we flew back to the VOR, crossed it, and described an arc on the opposite side. "We can do more of those if you want, but I think you have them nailed. How about we do the VOR-A into Le Roy, then go into the practice area and do something like steep turns that we have not practiced for a while?" I pulled out the plate for the Le Roy VOR-A approach, climbed to 4000 feet (the minimum starting altitude for the approach), and tracked back toward the VOR. At the VOR, I set up the CDI for the outbound course and started descending for the first leg of the approach. My tracking of the CDI was not good. Though it never reached full deflection, it was certainly not centered. Eventually, we were at 1400 feet (the minimum descent altitude) and journeying toward a point in the sky 12.6 miles from Geneseo that would put us over the airport. When the GPS read 12.6, Tom said, "ok, look outside and identify the airport for me". When I did, I saw nothing but farmland. The GPS showed the airport to be off my right wingtip. I looked to the north, but could not immediately locate it. 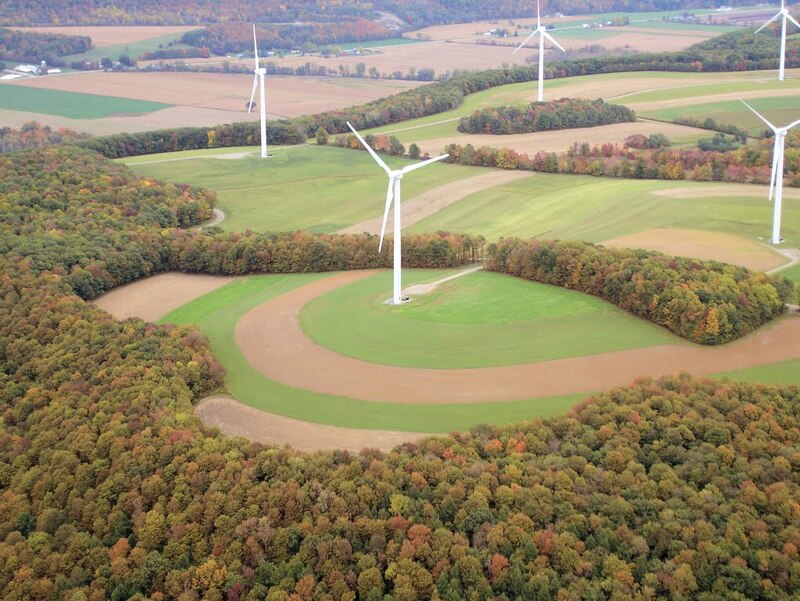 At 620 feet above the ground, trees presented a significant challenge to finding the airport. I located the quarries north of the runway, shifted my focus slightly ahead of them, and discerned my hangar through a gap in a treeline. I went to full throttle, pitched for climb, and pointed to the airport out the window. Naturally, Tom already knew where the airport was, he had watched it go by. I knew that my VOR tracking on that approach had been sloppy, but I did not think it was that sloppy. Once established in the climb, I started troubleshooting. I had set the CDI to indicate the 313° radial from Genseo. The approach course is actually 323°. Tom, of course, already knew. "We're going to do that again," I grumbled. "You bet we are," said Tom. "Not only did you have the wrong radial dialed in, but you didn't track THAT one very well. So, do it again. I want to see that CDI dead nuts on. I want your inbound altitude to be pegged at 4000. Tighten it up." Tom is generally so affable that I was taken aback by the sternness in his voice. Sometimes, a kick in the seat of the pants is exactly the right approach. Minimum altitude bust, the cardinal sin. "DAMMIT!" And though this had become something of a refrain, I said it with new found feeling. I immediately added power, regained 1400 feet and held it. Moments later, we reached 12.6 miles from Geneseo, the missed approach point. "Ok, look outside," said Tom. In the shadows of twilight, the lighted runway was directly below. I was directly over the center line. "Now that is how it's supposed to look! Good job!" said Tom. "Though," he added, "you forgot to start the timer at the final approach fix." I remained silent, grimly advancing the throttle to climb back to the VFR pattern altitude. I flew the pattern and settled the airplane on the runway. I went about my post flight activities with quiet purpose. "Talk to me," said Tom after we put pen to logbooks. "I'm frustrated," I said simply. "Well, I can see that from your body language." Of course he could. Tom is a people person and very perceptive, a quality that makes him such an excellent teacher. If he assumed the demeanor of drill sergeant after our botched approach attempt, he was now morphing into coach. "Look, I know you're frustrated with yourself for going through the MDA, but you recognized it right away and fixed it. Everything else was spot on. You flew DME arcs for the first time tonight and nailed them. You do a lot of things really well." He proceeded to enumerate my strengths, finishing with, "all that's left is practice and tightening everything up." After a pause he added, "and do you know what? I kept forgetting about the timer, too, when I was training. You'll get there." I have 20.3 simulated instrument hours (including a few hours carried over from primary and recurrent training over the years) with 0.3 of those being in actual IFR. There is not much new for Tom to teach me and no more scheduled lesson topics beyond the instrument cross country flight that we must complete together. I would like to build some additional actual IFR time, however. My primary goal is to refine my abilities and build hours with a safety pilot while getting better-acquainted with the Garmin 430W. I also need to take the FAA written exam, for which I have begun studying again after a lapse during spring and summer. The time I invested earlier this year was well spent; I am running at about 93% on practice exams. With the arrival of September, family obligations have increased, days have become shorter, and work schedules with potential safety pilots are not meshing well (I am also out of vacation - poor planning on my part). On top of all that, "winter is coming" and icy clouds are not terribly compatible with my humble little ship. But as Tom said, I'll get there. The primary goal of instrument flying is to get from place to place in zero visibility without hitting anything: mountains, towers, other airplanes, etc. It stands to reason that descending toward an airport increases the risk of a collision with any and all of the above. 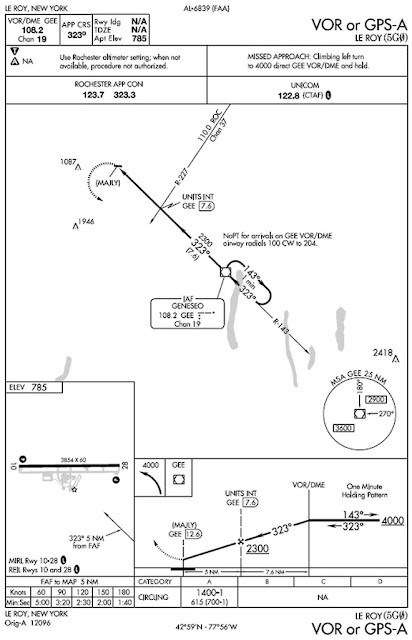 As a result, approaches are carefully written to enable visually impaired aircraft to safely descend toward a runway while protected from obstacles. For the pilot, flying approaches increases both workload and the need for precision. After several lessons aimed at building fundamentals, it was finally time for me to start flying approaches. Tom and I met at the airport at 8:00 am. I had struggled out of bed that morning and realized during the forty minute commute to the airport that I was quite fatigued. The thoughts whirling around inside my head would seem to mush into a soft spot (I imagined it to be on the left side, sort of in the middle) and dissolve into confused wisps of "oh, look, a chicken" disconnectedness. Neurons were not exactly crackling with crisp energy and I wondered, somewhat distractedly, how this would impact my morning lesson. At the airport, Tom and I briefed the two approaches that I would fly that morning. It all made perfect sense on paper. The first approach was a simple one and a very practical choice: the VOR-A approach into Le Roy. Our plan was to depart Le Roy to the west, intercept Victor 252 (the airway defined by the 314° radial off of the Geneseo VOR), and follow it back to Genseo. The VOR serves as the initial approach fix for the approach. Established in a climb from Le Roy, I was cognizant through past experience that we would reach V252 rapidly. In preparation, I set about "identifying" the VOR. All VORs transmit a Morse code identifier. Verification of that code confirms that the correct navigation beacon is being tracked. I switched the audio panel to "Nav1", patching the weak VOR signal into our headsets. This brought forth a loud burst of static and, within it, a faint signal. I cross checked the sequence with the chart and verbalized to Tom that the VOR was identified. At this point, we should have been close to the airway, but the course deviation indicator (CDI) did not so much as twitch. What was wrong? I scanned the instruments, my thoughts turning to chaos as they reached that fatigue-induced soft spot in my brain. For his part, Tom said nothing, waiting for me to troubleshoot the problem on my own. Then, I saw it. The CDI can be driven by either the GPS or the VOR. It was still in GPS mode from our recent cross country flight home from Mackinac Island and the Sleeping Bear Dunes. "Dammit," I grumbled, toggling the CDI back into VLOC mode. The CDI came to life and clearly indicated that we had traipsed right through V252. I turned to get back onto the airway and, in the process, blew through the 4000 foot altitude that Tom had assigned. I continued turning on course, reduced power, and aimed my ship back toward the planet. From that moment on, my brain was several seconds behind the airplane. Yes, we did my first two approaches that morning, but they were not pretty and required a lot of prompting from Tom. Lesson learned: Instrument lessons taken while fatigued are not a value-added proposition. We were tracking inbound to the Geneseo VOR on V252, riding the beam precisely with the CDI needle centered and maintaining a constant 4000 foot altitude. It was time to make up for the previous week's gaffes. The VOR-A approach into Le Roy is about as simple as they come. 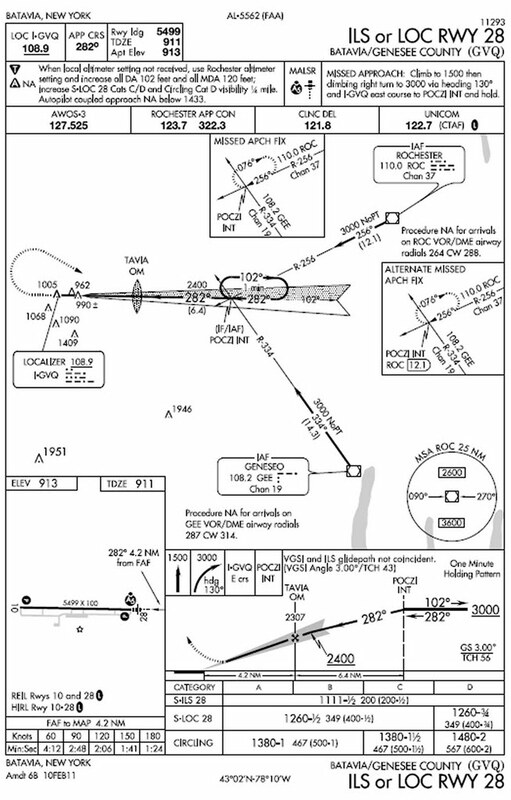 The Geneseo VOR is the initial approach fix and the approach is flown outbound on the 323° radial. It is designed to bring aircraft over the middle of the airport at 1400 feet, a mere 615 feet above the ground. And, wouldn't you know it, it actually works. At 1400 feet, 12.6 nautical miles from the Geneseo VOR, I looked outside to find the airport directly below. Because we were well below the VFR traffic pattern altitude, the view was a bit disconcerting to me. We should NOT be this low over the middle of the airport, said a voice in my head, sounding strikingly like that naysayer fish in The Cat in the Hat. We flew the missed approach course back to Geneseo and set up for the ILS-28 approach into the Genesee County airport in Batavia. For non-aviators, an ILS (instrument landing system) is a precision approach that brings aircraft down to 200 feet above the runway. Among other components, it consists of two radio beacons; a localizer that provides lateral guidance to the runway and a glideslope that provides vertical guidance. This approach is more complex than the simple circling approach at Le Roy, but the trade-off for that complexity is that it can bring you home when the ceiling is four hundred feet lower. The initial approach fix, POCZI (who names these things? ), exists within Rochester airspace as defined by the intersection of the localizer and the 334° radial from Geneseo. We contacted Rochester and told them what we wanted to do. 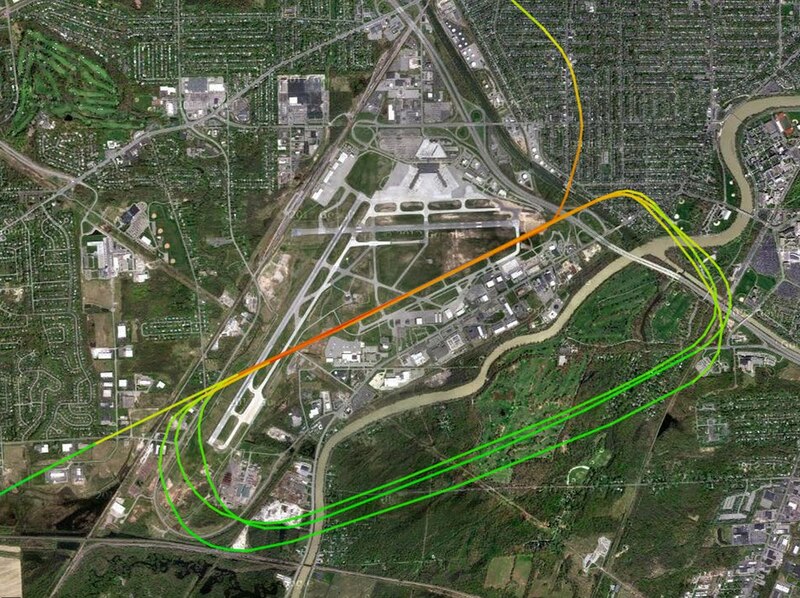 While waiting for a squawk code from Approach, I reconfigured the instruments and we tracked outbound from Geneseo. Once we established ourselves on the localizer at POCZI, we rode the glideslope down to the runway. As a student, I used to become very annoyed with aircraft flying practice instrument approaches, eschewing proper pattern entry and spouting "IFR-speak" position reports that did little to help me understand where they actually were. I did not want to be one of those pilots. I broadcast our intentions in clear VFR-speak on the Genesee County Unicom frequency while Tom watched for aircraft outside. Sure enough, there was a VFR aircraft in the patten and we coordinated carefully with it so that everything come together seamlessly. At the end of the exercise, I did not feel as though I was one of those IFR guys zooming straight-in on final approach without a care for other traffic already established in the pattern. At 1111 feet, 200 feet over the ground, I looked outside to see the runway numbers right in front of me. It was almost like magic! Granted, it was a kind of magic that only works after significant forethought and careful attention to detail, but it seemed magical nonetheless. We flew the missed approach sequence, requiring a course reversal and tracking outbound on the localizer "backcourse" (which basically means that the CDI reads backwards - always a treat). We did the holding pattern for the missed approach and returned to Le Roy in triumph. "You did awesome today!" Tom exclaimed, shaking my shoulder as we taxied back to the hangar. "You don't need to sound so surprised," I replied. Tom laughed. As I reflected on it, I realized that flying approaches is not difficult. Yes, it requires precise flying. But the challenge is really one of information management; sifting through the available data, having the right bits ready at the right time, and perhaps most important, being ready for whatever comes next. Maybe someday, I will actually be good at this. I was on ballast duty in the back seat of Darrell's Skyhawk. Rochester approach was vectoring him onto the ILS for runway 22. The controller brought Darrell right around to intercept the localizer. As we turned toward the airport, the 8000 foot long runway came into view. I studied the CDI, waiting for the localizer to center. Peering outside, I saw that we had passed through the extended runway center line. What's wrong? Finally, Tom spoke up, pointing out that the CDI was in GPS, not VLOC mode. It was the same mistake I made two lessons previous and it served as a good object lesson for both of us on how things can get away from you when the proper attention to detail is lacking. Darrell, Tom and I debriefed over lunch at the Gunsmoke Saloon, a little diner east of the airport on Route 5. On our way to lunch, Darrell described our destination as looking like a biker bar. Tom and I exchanged looks as we pulled into the parking lot and saw a nicely painted white building with a red roof and well tended landscaping. "Darrell," I commented, "biker bars don't tend to have shrubberies." Food at the Gunsmoke is plentiful, yummy, and very reasonably priced. When lunch was complete, it was my turn to fly. A relatively low deck of broken cumulus dominated the sky, products of early afternoon thermals. Tom filed an IFR flight plan as insurance. We launched into a turbulent ether, strikingly different from the placid morning air prevailing during Darrell's lesson. As we climbed, I called Rochester to activate our IFR flight plan, officially entering "The System" for the first time ever. We leveled at 3000 feet, just below the cloud deck. As with Darrell, Rochester provided vectors to bring us onto the ILS for runway 22. The approach generally went well, except that I forgot to start the timer at the final approach fix. Actually, I have forgotten to start the timer on every approach that I have flown to date, something of a "chronic" failing. 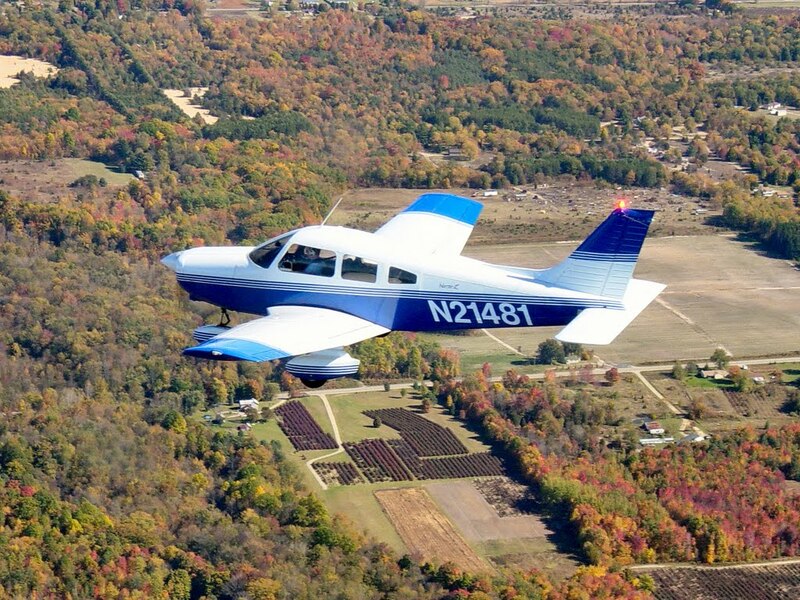 The missed approach procedure involves flying south to the Geneseo VOR and holding at 4000 feet. Though I was monitoring the instruments as we climbed, I noticed that the quality of light in the cockpit changing dramatically. From the back seat, Darrell said something to the effect of "here we go". I looked up for a moment to see nothing but gray beyond the windows. We were in a cloud; actual, not simulated, instrument conditions. "You are no longer a virgin," Tom proclaimed. "I'm just glad my first time was with you guys," I rejoined cheesily while steering the bouncing airplane toward Geneseo. Darrell made a gagging sound on the intercom. We called Rochester once established in the holding pattern, popping in and out of the clouds as we traced an oval course over the Upstate countryside. "Rochester approach, Warrior 481 would like to do the GPS-10 into Genesee County." The controller immediately responded to approve our request for the ILS-28 at Genesee County. When I corrected him, he responded with, "sorry, Warrior 481, GPS-28 approved." I exchanged a look with Tom and corrected the controller a second time. This worked and we were sent on our way to WUPIT ("whoopit"), the initial approach fix for the GPS-10 approach into Batavia. It would be my first GPS approach. 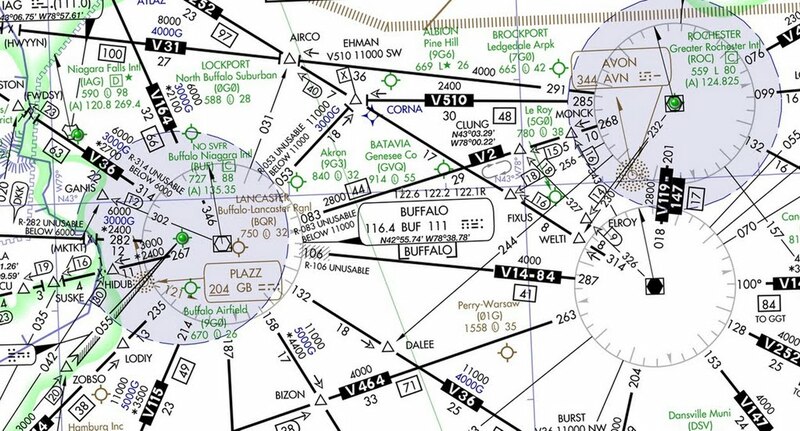 Because the initial approach fix is so close to Buffalo, Darrell and I got a good lesson in how Rochester and Buffalo coordinate to make these approaches happen. While Buffalo worked us on an eastbound approach to Genesee County, Rochester was controlling a jet making a westbound approach to the reciprocal runway occupying the same slab of pavement. As we reached the final approach fix to Genesee County, Tom and Darrell were busy looking for the jet that Buffalo informed us had broken off its approach. I forgot to start the timer again ("dammit!"). I flew the approach (an LPV) down to 200 feet above the runway, before peering outside to see the reassuring runway numbers directly before the Warrior's nose. Then, my attention was back on the instruments for the missed procedure. We entered a holding pattern near Rochester, then flew home. In the end, it was a milestone lesson: first time in the system (IFR flight plan), first time in actual instrument conditions (0.3 hours), first GPS approach, and my first ILS at a large airport like Rochester. Groovy. I left the airport feeling like I was on top of the world. Lesson ten started with a cell phone call to flight service. With the phone on speaker, Tom listened while I filed my first IFR flight plan (though I flew on a flight plan during the previous lesson, Tom had filed it, not me). We departed Le Roy and activated the flight plan in the air while en route to the Geneseo VOR. At this point, I was beginning to feel like Warrior 481 and I had worn a rut in the sky between Le Roy and Geneseo. 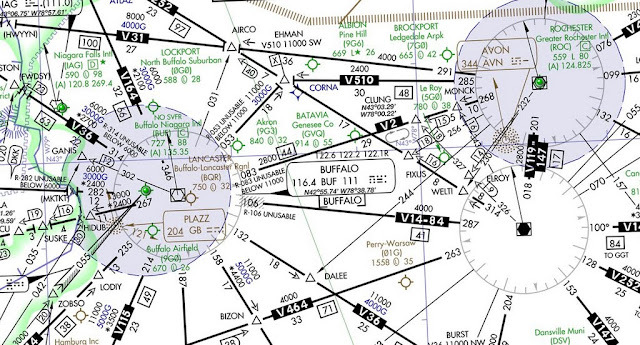 We reached the VOR and turned westbound on V14-84 direct to Buffalo. We were cleared for the ILS runway 5 approach as the sun sank below the horizon. As with Rochester, the Buffalo controller provided vectors to intercept the localizer. Except this time, the last intended vector was issued late, while we were already crossing the localizer course. Rather than setting us up to intercept the localizer, we were on a divergent heading. Fortunately, the Buffalo controller recognized his mistake quickly and countered by providing a new heading. Unfortunately, the corrective heading required intercepting the localizer at a challenging angle. "His fault, not yours," Tom commented as I struggled to capture the localizer and align with the extended runway centerline. But I got myself onto the localizer and held it and the glideslope well. Just before reaching decision height, Tom said, "go ahead and look outside, this is pretty cool." It was dark outside and city lights were working to counter the invading shadows. The runway was fully lit. I have not landed at many large airports at night, so the sight of the massive runway with full approach lighting took my breath away. "That is pretty cool," I agreed as we reached decision height and I advanced the throttle to start the missed approach procedure. Buffalo had assigned us a customized missed approach that would take us back to Geneseo on an east heading in lieu of the procedure published on the approach plate. Frankly, I was grateful not to fly the published procedure as it required a westward sojourn into Canada that would have done little more for me than waste fuel. "Rochester Tower, Warrior 481 going missed," I transmitted. "Warrior 481, fly approved missed approach procedure." As I began executing the procedure, I realized that I had just called Buffalo by the wrong name. "Well, that'll keep my ego in check," I commented to Tom as we climbed to our assigned altitude. "It might help if I called these guys by the right name, wouldn't it? What a doofus." At this, Tom burst out laughing. "Doofus! I haven't heard anyone say that in years!" As we leveled at 4000 feet on a heading back to the Geneseo VOR, Tom cleared his throat. "By the way, what did you forget to do at the final approach fix?" I knew the answer before he was done asking. We returned to Geneseo, did a procedure turn and flew the VOR-A back into Le Roy in the dark. The landing was an absolute greaser. It was my first night landing with an instructor since the days of flying N9327U out of Three Rivers, MI. After Tom left the airport, Darrell wandered out of his hangar and joined me on the ramp. I told him about the amazing sight of Buffalo's runway 5, lit up in all its glory, appearing before me at the completion of the approach. Once the runway lighting timed out, we stood quietly on the ramp, in the dark, gazing upward at the remarkably crisp stars above. With so little haze, the strobe lights of dozens of high altitude aircraft visibly blinked across the nighttime sky. Behind them lay a pale swath of ancient light, the unmistakable halo of the Milky Way. Indeed, it was a night of memorable sights. We were at 8500 feet, sliding smoothly over a scattered layer a few thousand feet below. Beside me in the right seat, The Bear was engrossed in a "Nancy Clancy" book. I touched her arm softly and she looked up at me. A smile bloomed across her face. "Yes!" Without hesitation, she reached forward and grasped the aluminum control yoke before her. It was her first time ever taking the controls. "Do you want to go right or left?" I asked. The Bear hesitated. "I don't know," she confessed. "How about right?" I suggested. Smoothly, The Bear turned the yoke, watching out her window as the wing dipped earthward at her command. "How about the other way?" Without responding, The Bear turned the yoke the other way and we smoothly transitioned into a shallow left bank. She beamed with pride as the airplane responded to her inputs, s-turning through the heavens. The look of absolute happiness on her face gave me goosebumps. Our objective that morning was to visit a couple of new airports and have lunch at one of them. Although the forecast boded well for visual flying in western Pennsylvania, reality presented a gloomy haze in the direction of both destinations and I decided it was time to activate Plan B. We turned eastward onto a new course toward St Mary's, PA, crossing the East Branch of the Clarion River / Lake. Seeing it brought back a strong memory from three years prior when we flew over this reservoir on another diversion to St Mary's. It was a night when good practices staved off an error of complacency. We landed at St Mary's Municipal Airport, the former home of The Silver Wing restaurant. Despite new ownership and a rechristening as The West Wind, the menu appeared to be the same. The ramp was empty of aircraft except for this Pitts. I pointed it out to The Bear by saying, "look, there's an airplane that's your size. It's called a Pitts." She considered the single seat aerobatic ship for a moment, then answered, "I know it's a Pitts...it's just like one of the pedal planes." A+ for The Bear and her terrific memory. We peered into the tight, single place cockpit. "How would someone learn to fly this airplane? There's no room for a teacher!" The Bear observed astutely. I explained that a pilot would have to learn on other airplanes and translate that knowledge to the Pitts. West Wind's dining room was closed to the public for a bridal shower, but The Bear and I were offered the balcony overlooking the airport ramp. We had it to ourselves and it afforded a great view of the aircraft parking area where Warrior 481 completely dwarfed the Pitts. The Bear dove immediately into the next book while we waited for our lunch. When the pilot of the Pitts strolled out to his airplane, donned his parachute, and climbed inside, The Bear rushed to the edge of the balcony to watch him depart. She was not disappointed. The Pitts climbed into the air crisply, leveled a few hundred feet over the runway, and performed an aileron roll. It was the first time The Bear had ever seen someone roll an airplane and she was impressed. The Pitts returned, performing another aileron roll on the second pass. The third pass was done completely inverted. When it returned a fourth time, the Pitts was at a higher altitude and the pilot performed a half Cuban Eight. "Cool," murmured The Bear as she watched in wonder. "You've never seen an airplane do that before, have you?" I asked. "Well," she said in a very businesslike manner, "I do stuff like that with my toy airplanes, but I've never seen a real airplane do that." I told her about female aerobatic pilot Betty Skelton who named her Pitts "Lil' Stinker". ...but she was literally asleep at the wheel. I let her have the nap, she does not take many these days. We bumped and wobbled back to Le Roy from St Mary's, PA. As we passed it, Rushford Lake seemed to point the way home. After cleaning up the airplane, we talked about taking more photos to commemorate the occasion. We thought that, maybe, we could do some digital editing to this one of her in the left seat, but decided that it would give Granny a heart attack. And so, we settled for this picture of The Bear demonstrating what she got to do with her own two hands. Every pilot remembers the first time he or she ever took the controls of an aircraft in flight. And now The Bear and I have experienced that milestone together. I hope that her adventure today was as joyful for her as my first experience was for me; and that she carries that joy in her heart no matter where she goes in life.